It is a branch of science that deals with the designing, construction, operation, and application of any machine. It also includes programming for controlling their controls, sensory, and feedback mechanism. It includes working on Avishkaar LITE, Avishkaar INTRO, and Avishkaar FULL. E-Series INTRO Kit is an introductory DIY kit based on STEM concepts of learning for young children. The INTRO kit at its core has the INTRO Brain unit that can control three DC geared motors. 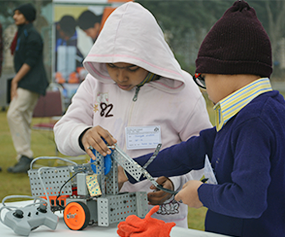 It also includes the Avishkaar Design system that has components in Assembly, Movement, Electronics and Tools categories for building a multitude of robotic mechanisms. An ergonomically designed remote has been included to help children control their robot efficiently. E-Series LITE kit contains a microcontroller based WiFi enabled E-Series LITE Brain and Avishkaar Robotronics Design system that includes components in Assembly, Movement, Electronics and Tools category for building a multitude of robotic mechanisms. The whole design system is build to create innovators of tomorrow. 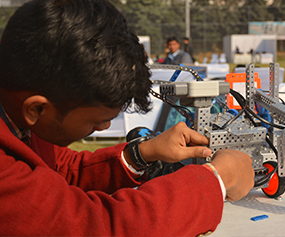 FULL kit contains a microcontroller-based, WiFi enabled and fully programmable E-Series FULL Brain and Avishkaar Robotronics Design system that includes components in Assembly, Movement, Electronics and Tools category for building a multitude of robotic mechanisms. The whole design system is build to create innovators of tomorrow. 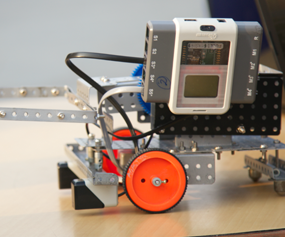 Sensors and Motors can be programmed using an intuitive block-based programming software-Avishkaar Maker Studio.